The Boys & Girls Club of Laguna Beach is proud to present their fourth Annual Night Under the Stars Gala, benefiting the Boys & Girls Club Lake Forest Program, on Friday, Aug 24. The event will be held at the Lake Forest Sun & Sail Club. Proceeds of the event will support the dream of funding a building for the Boys & Girls Club of Lake Forest. Admission and sponsorship opportunities are available at the Club’s site at www.bgclagunabeach.org. Guests will enjoy an evening of New York Jazz and nightlife, centering around this year’s gala theme. In addition to experiencing fine food and drinks, guests will also have the opportunity to bid on a wide range of silent auction items. Orange County Water Polo Club (OCWPC) finished strong at this year’s Junior Olympics, and the Laguna Beach High School Varsity Water Polo team was well represented by seniors Will Clark and Colton Gregory as well as junior goalie Caden Capobianco. Recently graduated and Cal Baptist bound Riley Bumgardner also represented Laguna on the 18U team. In addition to Laguna Beach, OC Water Polo Club also attracts athletes from Dana Hills, San Clemente, Rancho Santa Margarita and Aliso Niguel high schools. OCWPC competed in the 18U Boys Platinum Division at the National Junior Olympics July 21 - 24. Stanford University’s Avery Aquatic Center played host to the highest-level matches in the Championship Division. The boys’ team came out strong and won their first two matches against South Coast Water Polo (Thousand Oaks) and CHAWP (Chino Hills). The second day brought even tougher competition against #2 ranked Trojan (South Bay) and #10 ranked Del Mar. OCWP finished tournament play with an exciting win over Northern Cal favorite Lamorinda (10-5). OCWP finished an impressive fifth place in the elite competition. The School Board meeting of July 17 included a presentation by Laguna Beach Police Department (LBPD) Chief of Police Laura Farinella, during which she presented a memorandum of understanding between LBPD and the Laguna Beach Unified School District to provide a School Resource Officer (SRO). The meeting also addressed the prickly issue of changes to the Student Instructional Calendar. In an effort to further promote safety for our schools, the Laguna Beach Police Department is developing a School Resource Officer program that will seek to develop and enhance rapport between youth, police officers, school administrators, and parents. LBPD would assign one full-time law enforcement officer to serve as the SRO during the regular school year. 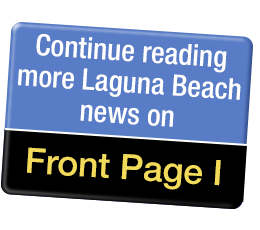 The SRO would be employed and retained by LBPD and school site principals would confer with the SRO to develop plans and strategies for improving safety on each Laguna Beach school campus, while adjustments to the program can be made throughout the school year. The public comments included some in favor of an SRO officer on campus for safety reasons, and some opposed, fearing that this presence would only escalate problems such as altercations between students, and could mean backpack searches for contraband. Chief Farinella stated at the meeting that it’s not about law enforcement, unless behavior is merited. Any enforcement would be in coordination with the school principal. There is training along guidelines from the School Resource Officer association including understanding education codes and social media issues. The chief clarified that there is no money exchange between the school district and the SRO. “We just want your approval to be embedded and woven into the fabric of the school system,” she said. The Board is expected to vote on the agreement at the upcoming August 21 meeting. If approved, it would take effect by the fall and would last until August 2021. Also at the July 17 Board meeting, staff presented revisions to the proposed 2019-20 student instructional calendar per Board direction from the June 19 Special Board meeting; the presentation included projected start and end dates for future years through 2022-2023. At the direction of the Board, staff will bring forward alternate start and end dates for future years to the August 21 Board meeting as an information item. After subsequent Board meetings (April 12, June 19), community input, and survey results, the committee identified its revised priorities for the school year. The top three factors identified in the committee’s survey results for the new curriculum calendar were, for those who supported the committee’s recommendation: that the semester end at winter break, that there would be increased test preparation, and that the Monday and Tuesday of Thanksgiving week be off. For those who opposed the committee’s recommendation, they cited family vacations, traffic, and empty beaches as issues. The committee’s revised recommendations have, thus, identified six factors of change in the 2019-20 instructional calendar: 180 school days, no change to Thanksgiving week (school in session on Monday and Tuesday), two district-wide non-student days (January and March), starting approximately one week earlier on August 26, finals ending before winter break, and the school year ending June 11. For more information, the revisions to the proposed student instructional calendar may be seen here. Laguna Beach Unified School District welcomes a new Director of Assessment and Accountability, Dr Chad Mabery. Mabery joins LBUSD from the Manhattan Beach Unified School District where he previously served as the Director of Data, Assessment, and Professional Development in the Educational Services Department. With almost 20 years of experience as an educator, Dr. Mabery has held roles as a middle school teacher, vice principal, and principal. He received his Doctorate of Education in Education Leadership from UCLA and his Master of Arts in Education Administration from California State University, Dominguez Hills. Laguna has responded to the growing crisis of sports related brain injuries with the purchase of new helmets for the football team. The new helmets are designed with specific cushioning technology and are intended to help protect players from concussion. The helmets, called the Vicis Zero1, look similar to regular helmets from the outside, but beneath the surface they are layered with high-tech cushioning. They consist of lots of separate spring-like columns in multiple layers. According to the manufacturer, this keeps the head protected from multiple forces. The softer outer shell helps to slow impact forces before they reach the head and brain. The Zero1 also offers a wider field of vision than traditional helmets. The NFL has recently invested in preventing, diagnosing and treating head injuries including a program called the Head Health Challenge – a competition to encourage companies to study and develop products to improve player safety. Vicis was one of the winners. The Vicis Zero1 helmet was designed by scientists and engineers, along with Vicis co-founder, Sam Browd, who is a pediatric neurosurgeon. In 2017, the Zero1 helmets were worn by more than 60 NFL players, including Russell Wilson, Alex Smith, Doug Baldwin, Golden Tate, and Lamar Miller. LBHS Football confers with coach – are they excited about the new helmets? Yes! While no helmet can assuredly prevent concussions, testing by the NFL and the NFL Players Association over the last several years concluded that the Vicis Zero1 ranked highest in safety. Vicis has recently made the Zero1 helmets available online, and for high schoolers, at a price point below the NFL level at $1,500 per helmet. According to the Zero1 site, the helmets will cost $950 for these students. Timothy Robert Smith is the artist wielding the paintbrush. The work is in progress on the side of the school building that heads down to the track and field. It depicts students and their interests – including sports and academia, dance, marching band, etc., from a perspective seeming to float above. The piece is similar in its use of perspective to one Smith created for LCAD (across Laguna Canyon Rd from the main campus). The LCAD mural is like looking at the view from below, whereas the high school mural is what the artist describes as “a twisted view.” Smith is also a teacher at LCAD, and is working on the mural with the help of some of his students. The Anti-Defamation League (ADL) has designated Laguna Beach Unified School District a No Place for Hate® district, recognizing its commitment to creating safe and respectful learning environments for students. No Place for Hate is a research-based initiative that follows many of the recommendations for creating a positive school climate laid out by the National School Climate Center. The initiative provides PreK-12 schools with an organizing framework for combating bias, bullying, and hatred, leading to long-term solutions for creating and maintaining a positive climate. A district must fulfill several requirements to receive a No Place for Hate designation including a district-wide needs assessment. LBUSD accomplished this by gathering data from all students, staff, parents, and guardians to assess school climate strengths and areas of need. The process included universal screenings that provided detailed insight into the quality and character of the students and school life. Additionally, each school site must form a No Place for Hate committee, sign the No Place for Hate Promise, and complete three or more school-wide activities during the school year that recognize differences and promote respect through active learning. The ADL will present LBUSD with the No Place for Hate designation at the school board meeting in the fall. Each school in the district is pursuing a broad campaign with the goal of No Place for Hate. At El Morro Elementary, the Character Counts® program is a school-wide initiative that teaches character development based on six ethical values: Trustworthiness, Respect, Responsibility, Fairness, Caring, and Citizenship. Each month, students are invited to participate in activities that practice those values. The month’s activities culminate with an assembly recognizing students who demonstrated a true understanding of the ethical value in theory and practice. At Top of the World Elementary, students participated in activities throughout the year like “No One Eats Alone Day” and welcomed guest lecturers like Sam Silberberg who visited the school on the anniversary of his escape from a death march to speak against bullying. Thurston Middle School encourages its students to “Be Thurston.” Being Thurston means to be an up-stander, be a friend, be a role model and be Thurston SMART. Thurston SMART students: Solve their problems, Make great decisions, Achieve, Respect, and are There and Ready. These philosophies are supported by school-wide activities that are developed around a different theme each month and rotate through subject areas. At Laguna Beach High School, a committee made up of students from each grade level is dedicated to the implementation of character development activities campus-wide. The activities often encourage civic engagement through the presentation of timely and relevant topics of discussion that bring heightened awareness to the entire student body. At the June 26 School Board meeting, the Board of Education took a moment to recognize the community partners whose dedication and support allow the LBUSD to expand and enhance educational opportunities for students. These community partners included: Lumberyard Restaurant, Cary Redfearn, owner, an Outstanding Business Partner; Festival of Arts Foundation, Scott Moore, president; PTA Council, Sheila Parker, president; SchoolPower Endowment, Chris Clark, president; SchoolPower, Kristin Winter, president, Robin Rounaghi, executive director (retiring this year). Additionally, the Board took action to approve the final 2018-19 All Funds Budget that was brought forward for public comment at the June 12 School Board meeting, and to approve the instructional minutes for all LBUSD schools for the 2018-19 school year. The bell schedules will be made available under the About section on each school website. Four LBHS teachers were awarded grants totaling $20,000 from the Festival of Arts Foundation to enhance the fine arts department, specifically the school’s art, ceramics, dance, and theater programs. Each teacher received a $5,000 grant for their program. On June 20, LBUSD kicked off the summer break with its annual end of the year employee appreciation barbecue. The open session of the LBUSD School Board meeting will begin at 6 p.m. tonight (Tuesday, June 26). The Board will recognize several community partners for their contributions to the district during the school year. The Board will consider action on the Local Control and Accountability Plan (LCAP), the all-funds budget for 2018-2019, and instructional bell schedules for each school site. The Board will also consider action on approval of routine annual agreements and the 2018-19 proposed employment agreements for management and unrepresented staff, including contract amendments for the Superintendent and Assistant Superintendents. The agenda for Tuesday’s regular Board meeting has been posted here: www.lbusd.org/ page.cfm?p=1046.